Although he spent a great deal of his life abroad, James Baldwin always remained a quintessentially American writer. Whether he was working in Paris or Istanbul, he never ceased to reflect on his experience as a black man in white America. In numerous essays, novels, plays and public speeches, the eloquent voice of James Baldwin spoke of the pain and struggle of black Americans and the saving power of brotherhood. During this early part of his life, he followed in his stepfather’s footsteps and became a preacher. Of those teen years, Baldwin recalled, “Those three years in the pulpit – I didn’t realize it then – that is what turned me into a writer, really, dealing with all that anguish and that despair and that beauty.” Many have noted the strong influence of the language of the church, the language of the Bible, on Baldwin’s style: its cadences and tone. Eager to move on, Baldwin knew that if he left the pulpit he must also leave home, so at eighteen he took a job working for the New Jersey railroad. After working for a short while with the railroad, Baldwin moved to Greenwich Village, where he worked for a number of years as a freelance writer, working primarily on book reviews. 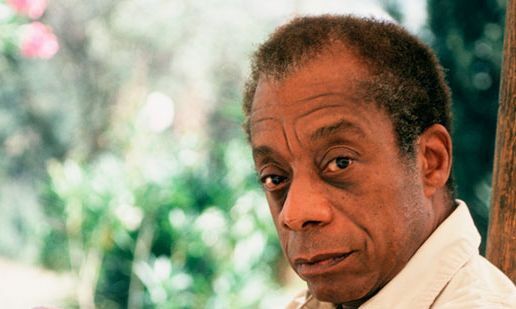 He caught the attention of the well-known novelist, Richard Wright – and though Baldwin had not yet finished a novel, Wright helped him secure a grant with which he could support himself as a writer. In 1948, at age 24, Baldwin left for Paris, where he hoped to find enough distance from the American society he grew up in to write about it. After writing a number of pieces for various magazines, Baldwin went to a small village in Switzerland to finish his first novel. Go Tell It on the Mountain, published in 1953, was an autobiographical work about growing up in Harlem. The passion and depth with which he described the struggles of black Americans were unlike anything that had been written. Though not instantly recognized as such, Go Tell It on the Mountain has long been considered an American classic. Over the next ten years, Baldwin moved from Paris to New York to Istanbul, writing two books of essays, Notes of a Native Son (1955) and Nobody Knows My Name (1961), as well as two novels, Giovanni’s Room (1956) and Another Country (1962). The essays explored racial tension with eloquence and unprecedented honesty; the novels dealt with taboo themes (homosexuality and interracial relationships). By describing life as he knew it, Baldwin created socially relevant, psychologically penetrating literature … and readers responded. Both Nobody Knows My Name and Another Country became immediate bestsellers. Being abroad gave Baldwin a perspective on the life he’d left behind and a solitary freedom to pursue his craft. “Once you find yourself in another civilization,” he notes, “you’re forced to examine your own.” In a sense, Baldwin’s travels brought him even closer to the social concerns of contemporary America. In the early 1960s, overwhelmed by a sense of responsibility to the times, Baldwin returned to take part in the civil rights movement. Traveling throughout the South, he began work on an explosive work about black identity and the state of racial struggle, The Fire Next Time (1963). This, too, was a bestseller: so incendiary that it put Baldwin on the cover of TIME Magazine. For many, Baldwin’s clarion call for human equality – in the essays of Notes of a Native Son, Nobody Knows My Name and The Fire Next Time – became an early and essential voice in the civil rights movement. Though at times criticized for his pacifist stance, Baldwin remained an important figure in that struggle throughout the 1960s. After the assassinations of his friends Medgar Evers, Reverend Martin Luther King, Jr., and Malcolm X, Baldwin returned to St. Paul de Vence, France, where he worked on a book about the disillusionment of the times, If Beale Street Could Talk (1974). Many responded to the harsh tone of If Beale Street Could Talk with accusations of bitterness – but even though Baldwin had encapsulated much of the anger of the times in his book, he always remained a constant advocate for universal love and brotherhood. During the last ten years of his life, he produced a number of important works of fiction, non-fiction, and poetry. He also turned to teaching as a new way of connecting with the young. By 1987, when he died of stomach cancer at age 63, James Baldwin had become one of the most important and vocal advocates for equality. From Go Tell It on the Mountain to The Evidence of Things Not Seen (1985), James Baldwin created works of literary beauty and depth that will remain essential parts of the American canon.